Established in the mid-1960’s by Austrians Pepi Gramshammer, Eric Sailer and Anderl Molterer as an Alpine Ski Racing summer training ground. Beartooth Basin (formerly: The Red Lodge International Ski and Snowboard Camp) is one of North America’s oldest alpine ski training areas. As the previous owners aged, they found themselves bowing out to a younger generation of skiing enthusiasts who looked to open the area to the public and not just the private groups and teams as had been tradition in the past. The newer ownership group has changed a bit over the years and is now majority controlled by the team listed below. The ski area is staffed with professional ski patrol and and lift attendants just as any other ski area, but with a summer like setting above 10,000 feet that can sometimes turn to winter at a moments notice. Please note, there is no lodge or warming hut facilities. You could call it backcountry skiing with a lift. A new owernship group was established in 2003 and the partnership keeps Beartooth Basin's platter lifts turning with the help of their amazing staff. Austin is the Operations Manager. He is a life-long native to the Beartooth region, has worked at the Basin from 2003 to present. Outdoor Emergency Care, Professional Ski Patrol, Avalanche Level 2, Guide/Owner Beartooth Mountain Guides - Red Lodge, MT. Justin grew up in Billings Montana, all the while skiing at Red Lodge Mountain. Years of ski racing on the Silver Run Ski Team helped hone the skiing skills. Ten years of skiing on the World Free-skiing Tour, which included 6th overall in 2004, and 9th overall in 2007. Consistent, safe skiing also led to 30 top 15 finishes. When Justin isn't chasing powder around the world, he is usually busy exploring for minerals around North America. Kurt began working in the ski industry in 1973, ski instructor from 1975 to 1987, nationally certified in 1978; Certified Level 3 in Northern Intermountain Division from 1981 to June 30, 1996; Red Lodge Ski School 1975 to 1981; Sun Valley Ski School 1981 to 1986; Portillo Chile Ski School 1982. As a third generation Montanan and native of the Absaroka/Beartooth Front, David is a lifelong skier who has been summer skiing in the mountains around Beartooth Basin for nearly 40 years. A former national ski patroller at Dartmouth College and an avid Heli Skier. 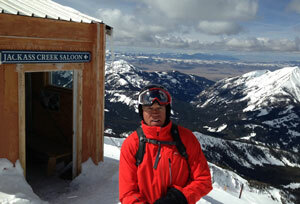 David also logs 25 - 30 days a year skiing the Big Sky complex as well as at the Basin.